Chase Fraser scored with Shawn Evans assisting at 1:51 of overtime Saturday night to give the Buffalo Bandits a 12-11 National Lacrosse League victory over the Saskatchewan Rush at Sasktel Center in Saskatoon. After leading nearly the entire game, the Bandits needed a late goal by Evans with 2:09 to play to force overtime before they went on to win on Fraser’s tally in the extra frame. Evans was won of three Bandits who scored two times in the game. He also had four assists for a six-point night. Corey Small and Dhane Smith also scored twice for Buffalo. After a 5-5 first half, the Bandits took a 9-6 lead nto the fourth quarter but could not hold the advantage. The Rush scored five of the next six goals to take an 11-10 lead. Mark Matthews, who had four goals overall, scored three of the Saskatchewan goals in the rally. He also had three assists. 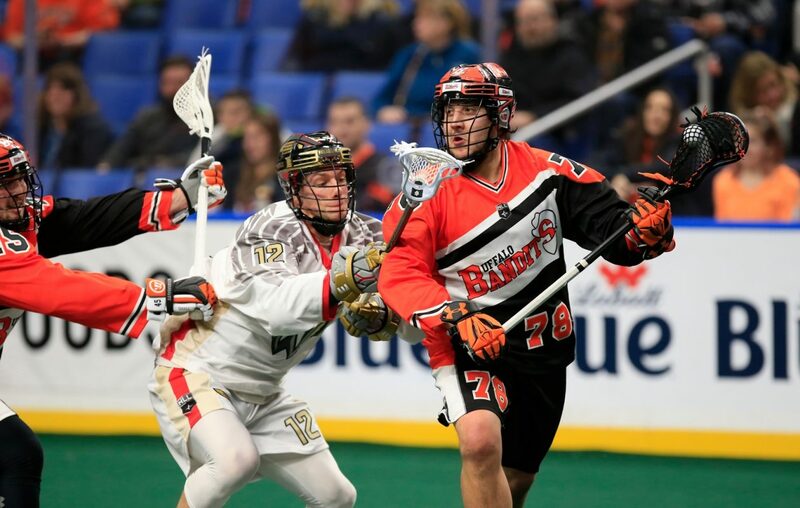 The Bandits went into the game assured of a berth in the NLL playoffs. That was because of the Rochester Knighthawks’ 15-14 loss to the Georgia Swarm in Blue Cross Arena on Friday night. It assured Buffalo of at least finishing in the top four in the Eastern Division of the NLL and the top four make the postseason. The Bandits, who are now an NLL-best 11-3, andf have only four games left. Rochester is 2-9. Left on the schedule for Buffalo are a home-and-home against the Toronto Rock, a home game against the New England Black Wolves and a road game at the San Diego Seals in the regular-season finale on April 27.